Tamarack Products - finishing equipment for the business forms and packaging industries. 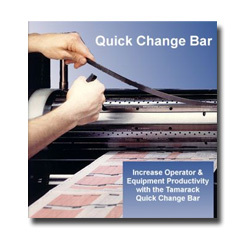 The Quick Change Bar is machined specifically for the width and depth of your slots. Strong springs, combined with "T"-shaped retaining blocks, hold the bar and blade securely in the slot while cutting, yet allow the bar to rock back easily for blade changes. Made from high-strength steel, the bar is manufactured to tight tolerances for long life and reliable operation. Setup time is reduced because there are no jacking screws to adjust or shims to install. When height adjustment is necessary, the patented central height adjustment feature provides precise control of the blade height across the entire width of the bar. This is a valuable feature, especially for difficult cutting jobs such as forms with microperforations.